Actor Alec Baldwin will have more time on his hands. He and MSNBC have announced that Up Late with Alec Baldwin will not be returning from its two-week hiatus. A statement reads, “We are jointly confirming that Up Late will not continue on MSNBC… This is a mutual parting and we wish Alec all the best”. The show had been scheduled to return on November 29th. It had been off the air for two weeks following Baldwin’s yelling a homophobic slur at a paparazzo. The actor later apologized for what he said. A weekly interview program, Up Late with Alec Baldwin debuted on October 11th. The cable channel had high hopes for the series but the ratings weren’t very good. Only five episodes were produced. What do you think? 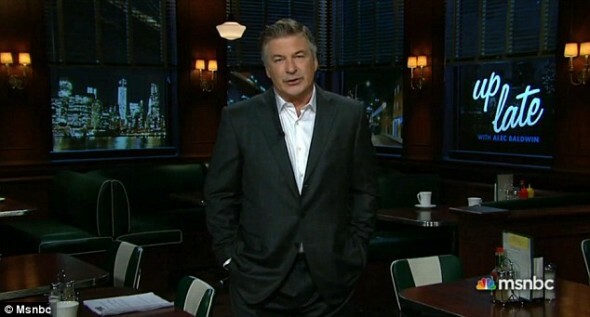 Did you check out Up Late with Alec Baldwin? If so, would you have kept watching? More about: MSNBC TV shows: canceled or renewed?, Up Late with Alec Baldwin, Up Late with Alec Baldwin: canceled or renewed? Melissa Harris-Perry: Cancelled by MSNBC or Host?